Explanation | The Big Bang? There was a time when bright feathers alone flew through the sky. Not part of any bird, they came from the first unfolding, and they shone the morning after the mist cleared. These feathers were so tiny, and so light (lighter than any feather you can imagine in fact) that they moved as fast as light itself. All their colours shimmered at once as they enjoyed their new found freedom, free in an open sky that was empty and smooth. Empty, smooth – and quiet… quiet… and getting worryingly quieter. For in this sky there was no wind, not a breath, not a cloud, and not a song. The feathers flew through this silent sky, but, excitable as they were, they could not stand such a dull environment. So, like children like to do, they waved themselves about and ran into the air, saying “Come on! Lets keep it moving!”, but the air, being air, just wanted to be cool, and get itself together. Down in the underdistance, a Dreamtime chameleon looked up from her work through swivelling sideways eyes. She watched this movement in the skies and smiled, then went back to her building. She knew more than you or I how this story will turn out to be, as she has seen it all happen before – she has seen all kinds of things on her trips on roots and branches between worlds, and she knew you could not have feathers forever without any kind of bird. And besides, universes are dull places no-one has any songs to sing. So, to welcome this bird into the world she shaped the branches of a special kind of tree. An invisible tree. A dark tree. You see, because it was made by a chameleon, you or I could not see it, though in a way we do, even today, sit in its branches. The feathers certainly couldn’t see the tree, as they moved too fast, and also they couldn’t feel it or know it was there as they were so very, very…. light. As they rushed around above, getting tired and confused, the chameleon drew in the air that was scattered here and there, and called it all down into the space between the branches she had prepared. The tiny feathers, sensing their smooth air was disappearing, flew onwards and outwards, somewhat unaware. The chameleon took this air she had gathered and pressed it together, into a little tiny ball. She pressed and she pushed it so powerfully, with such strength, that it started to glow a radiant blue – the original colours of the first firebird. She pushed again, and the inwards turned outwards and the ball of fire-air grew, and grew and grew and grew, until out of her hands flew the first Firebird. You see – it hadn’t yet learned how to sing. So it let out that single note (Or maybe it was two) and it flapped inside the dark branches, sending out a trail of feathers and shouting out its simple song, which in essence was ‘Me! Me! look! I am here’. But no-one else could hear this calling out. There were a few other firebirds that scattered those early skies, but they were all doing exactly the same things, all shouting their names, calling out at the same time, and so none of them ever heard a thing. And with that, the first Firebird drew within itself, shrunk from a being full of colour into a small grey pebble, and in almost the same instance, bounced out again with unimaginable force. Billions of tiny feathers flew out in all directions and it sang out a lovely, complex, rich song, which held within it a small piece of everything that now exists. The dreamtime-chameleon (who had temporarily popped out as she had left some soup on in another universe) felt some strange vibrations come along the canopy (or was it the roots?) and came back to find there was was no longer a Firebird anywhere around. She put her hands out, felt around, and brushed over new bits and pieces that felt interesting and different. She always manages to suprise herself with the things she accidentally creates. She drew some of these bits, the pieces of the end of the first Firebird, down into a space in her dark tree, and mixed them together with the air. She moulded and pushed the air together with these heavier pieces and pressed and pushed and moulded and pressed and pushed them together until, once again, they glowed blue. Then it expanded. The second generation of the Firebirds emerged – smaller, more polite, and with a quite gorgeous song. The dreamtime-chameleon found it much easier to make these birds the second time around, and felt she had made a bird many times more beautiful, and so she went along the branches, pulling more air and bits and pieces together and moulding them into firebirds, and more firebirds, until she had a whole community of them that all nestled together inside the comfort of the dreamtime-chameleon’s nest. She went down along the trunk, off through the underdistance of the forest floor, content that these ones would be just OK. Finally, these Firebirds were not just screaming incoherently – they had some songs – they almost had a language. They talked and chirped all through the day from the different parts of their nest… about how they were feeling, whether they were a bit warmer or a bit cooler than the day before, or whether the weather had or hadn’t been better or worse. They talked of many things, but they never really noticed the strange fact that they were resting on invisible branches. So, they commented on the quality of each others plumage. They joked about beak size, which would then lead on to more serious criticisms of song structure and tone. After some time, all couped up in their nest, they started to get on each others feathers. Something seemed amiss. The truth of the matter was, almost everything was amiss, because all there was in the universe was firebirds. Firebirds, some chatter, some songs – but not much else. Late one evening, one of the firebirds in the nest felt a deep grumbling in her stomach. And with that, the second Firebird drew within itself, shrunk down, down from a vast being full of colour into the tiniest grey pebble, and in almost the same instance, bounced out again, became huge again, with unimaginable force. Billions of tiny feathers flew out in all directions and it sang out a gorgeous, divine, full-bodied song, which held within it the essence of which all things are made of; Saucepans, tomato ketchup, swimming pools, clouds, marbles, felt-tip pens, you and me – you name it, anything you can think of contains elements expelled in fantastic fashion by one of the second firebirds. One by one, all the second firebirds followed this pattern, shrinking down before bursting out in song. The invisible chameleon crawled back along the invisible canopy and felt piles of even newer, even heavier, even more interesting shapes with her invisible paws. She was so engrossed she didn’t look up to notice the rest of the second firebirds blowing up in unimaginable colour and tone all over the invisible treetops. The invisible chameleon took all these pieces further up, where the branches are wider, and put them inside a large nest – a huge nest – a nest as big as a galaxy – she put in all the air and the dust and the bits and the bobs, and swirled them around fast enough so they mixed into balls and gaseous globes and ice demons and moons and life and refrigerators and socks, and yes, the third Firebirds, the loveliest ones of all, with a glowing warm heart, a life that is long and strong, and a song sung to us as beautiful as morning sunlight dancing on a cool water stream. It is one of the third firebirds we see today, flying through our blue skies. So when you look up, remember; every bit of you was once a part of that that endless sky, and we would not be here if it weren’t for the firebirds and their beautiful, evolving songs. The ‘mist cleared’ refers to the time when the first atoms were formed in our universe, when photons were suddenly freed from their continous interaction with the smaller elements of matter. When protons, neutrons, and electrons were distinct from each other, photons could not pass through, and the universe was like a thick, luminous soup – a plasma. The dreamtime chameleon represents the force through which we know dark matter to exist – gravity. The invisible tree, the branches and the nests represent the structural qualities of dark matter. Dark matter was there right at the beginning of the universe. Could it be the thing that links our universe to other universes? We can’t see dark matter, because it does not interact with photons – the particles and/or waves that make up visible light. ‘Feathers’ are meant to represent these photons. 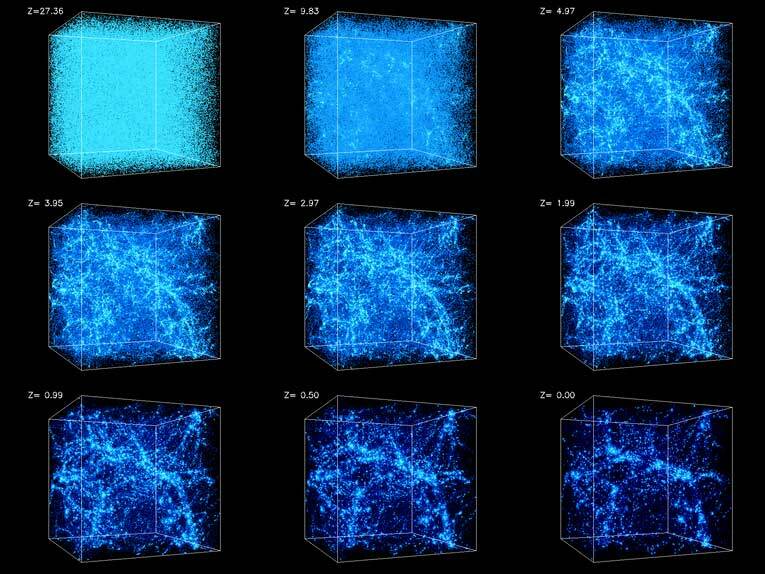 over time, the structure of dark matter has changed from a homogenous form to one more ‘net-like’. It is within the spaces of this net (or, if you like, the branches of the tree) and through the force of gravity which ‘pooled’ the hydrogen atoms together into a cluster, and the hydrogen atoms collapsed into the first suns. the quality of the ‘song’ refers to the range of elements a star can give out. The first stars could only produce more hydrogen, helium, and a tiny amount of lithium. Their song was also ‘loud’ because the heat and light they would have emitted was so powerful. This is a description of a supernova. As all the gases burn up, the star starts to fall in, to implode on itself, through gravitational collapse. All the matter of the star is concentrated into a tiny, incredibly heavy neutron ball, which is a point of maximum compression. Since the star can implode no more, the rest of the matter bounces back out in incredible fashion. Atoms break apart and recombine in new forms. The first supernovae would have created a ‘sample’ of almost all the elements that now exist. Many of the second generation of stars may have existed in star clusters. The supernovae of the first generation stars did not create enough of the heavier elements for the universe to form solar systems, planets, and life. It was the supernovae of the second generation stars that created enough of the more complex elements to form planets, and the third firebirds, such as our sun, have enough of the heavier elements in them to make them stable enough to support life. Over the course of the universe, the structure of dark matter has changed – whereas the first stars were possibly brought together by dark matter ‘halos’, our whole galaxy is wrapped and supported by dark matter – it allows us to spin at the speed we do – if it were not for dark matter, our galaxy would fly apart.